The recent release by the Federal Housing Finance Agency (FHFA) shows that its measure of house prices, House Price Index—Purchase Only, rose by 5.1 percent on a 12-month seasonally adjusted basis in January 2015. This marks the 36th consecutive month of year-over-year growth. Over this nearly three-year period, house prices have risen by 20.1%. Similarly, the recent release from Standard and Poor’s (S&P) and Case-Shiller indicates that their measure of national house prices, the House Price Index—National, rose by 4.5 percent on a year-over-year seasonally adjusted basis. This is the 33rd consecutive month of year-over-year increases in the house price index. Over this period of more than two-and-a-half years, house prices have risen by 22.1 percent. 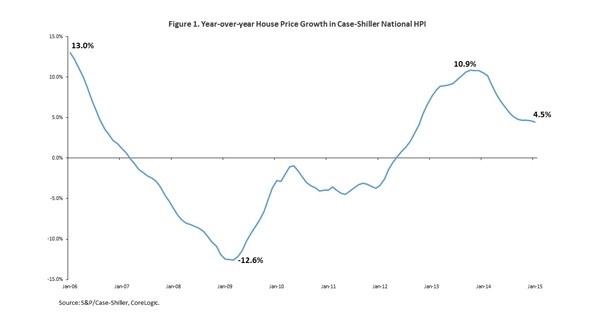 According to the S&P/Case-Shiller National House Price Index, year-over-year house price growth was slowing in recent months. In each month between December 2011 and October 2013, the 12-month change in house prices was higher than the previous month. Year-over-year house price growth peaked at 10.9 percent in October 2013. However, as Figure 1 below illustrates, annual house price growth was 4.5 percent in January 2015. 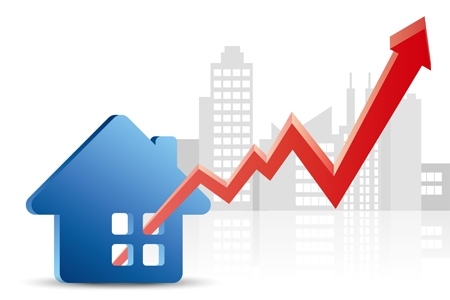 House prices are expected to continue to grow and few expect house prices to go down. According to separate data from Fannie Mae, although most expect house prices to continue to go up, senior mortgage executives are more optimistic about house price growth than the average consumer. The difference in the level of optimism about future house price growth largely reflects consumers’ view that house prices will likely stay the same over the year. 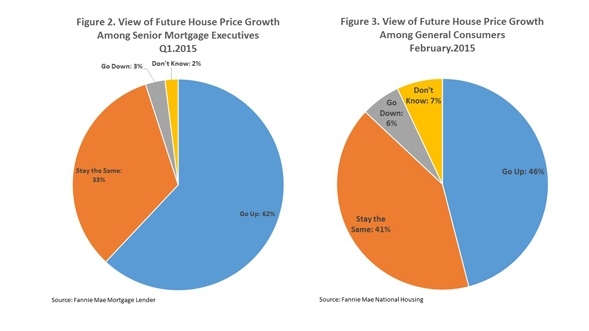 As Figure 2 below illustrates, 62 percent of senior mortgage executives, when polled by Fannie Mae’s Mortgage Lender Sentiment Survey, expect house prices to rise over the next 12 months. Meanwhile, one-third of senior mortgage executives expect house prices to stay the same while only 3 percent expect house prices to fall over the year. According to the National Housing Survey, a representative survey of the general population that is also administered by Fannie Mae, the greatest proportion of consumers, 46 percent, believe that house prices will rise over the year, but 41 percent believe that house prices will remain the same, 8 percentage points higher than the share of senior mortgage executives that express the same view. Meanwhile, only 6 percent of consumers believe that house prices will fall. View this original post on NAHB’s blog, Eye on Housing.